Happy Halloween everyone! It's been such a fun month playing about with Halloween make up tutorials again this year - I've been sparkly and glittery in galaxy-inspired make up, looked a bit startled in Queen of Hearts make up, grunged up as Furiosa from Mad Max, and embraced my gory side with bloody stapled face make up. It's been a bit rough round the edges at times, but it's been fun to do, and that's sort of the whole point of these tutorials - if I can do them, you can too! River Island got in touch to challenge me to put together a #RITrick or a #RITreat make up look, so I couldn't resist doing one more post. I was sent a selection of accessories and make up to inspire me, including this adorable comb-in hair chalk - which I knew I wanted to use! It reminded me of the type of thing I would have loved as a teenager, so that's what inspired this look - it's grungey, but still a bit pretty, and requires nothing other than a steady hand putting on eyeliner (the mantra of my teenage years!). Start by building up the colours of your pastel smokey eye. I used a glittery light yellow in the corner of my eye, then layered a pinky-peach colour on top of that. I then took a fluffy little brush and a slightly darker pink, and swept this quite dramatically all around my eye, pulling the colour down onto the tops of my cheeks (I wanted to look a bit grungey - almost like the area was bruised) and sweeping out towards my ears. I then added purple eyeshadow to the outer corners of my eyes, and used a brush to blend these all together. So far, so colourful! Now to get a bit darker! Blend in black shadow along your lower lash, and use your finger to make it a bit smudgey (the NARS shadow stick is great for this). Take your kohl eyeliner and carefully go along your waterline, and then use liquid eyeliner to create a cat's eye with a dramatic flick. Use your liquid eyeliner to draw on small spiders around your eyes (or the best spider-like blobs you can do!). This bit is completely inspired by Valfre - an illustrator who draws super sassy girls with star freckles (she also makes the best accessories, check out her phone cases!). 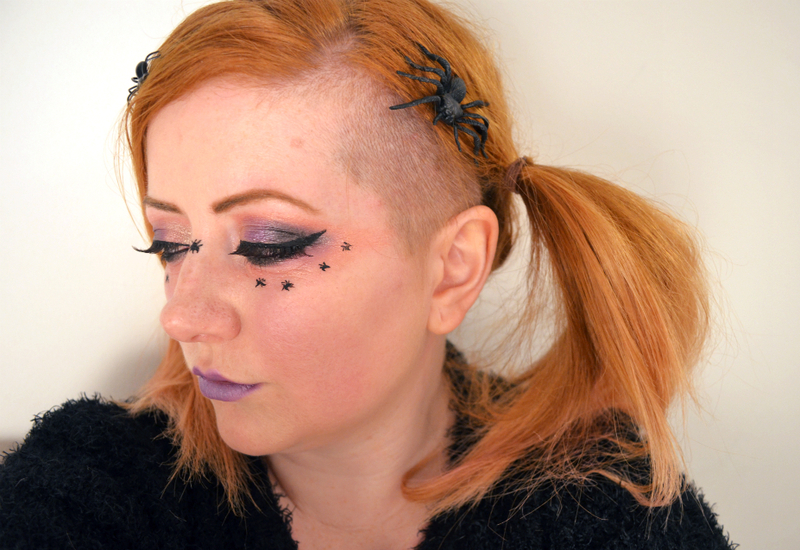 Then to finish up, put on purple lipstick (I used a light purple, and dabbed a darker purple eyeshadow onto it), and pin some spiders in your hair! Use the hair chalk to brush through the ends of your hair, for a pinky/purpley vibe. Dress top to toe in black, and scowl at anyone you see. Have fun!